(CNN) White nationalists and counterprotesters are expected to flood downtown Charlottesville Saturday as the Virginia city braces for the “Unite the Right” rally. By noon, thousands are expected to gather in Emancipation Park, where barricades have been placed in proximity to the statue of Confederate Gen. Robert E. Lee. The rally comes hours after a large group of torch-bearing white nationalists marched through the University of Virginia campus Friday night. Outraged by the city’s plans to remove the trace of its Confederate past, alt-right activists and Ku Klux Klan members have come to the city in recent months. The city has become ground zero for white nationalists, neo-Confederates and alt-right activists from across the country protesting the removal of Confederate monuments. 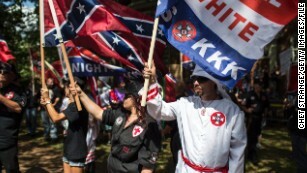 Police anticipate the rally will attract as many as 2,000 to 6,000 people and could be the “largest hate-gathering of its kind in decades in the United States,” as described by the Southern Poverty Law Center. Approximately 1,000 law enforcement officers and first responders, including the largest deployment by Virginia State Police in 30 years will also be on site, Charlottesville City Manager Maurice Jones said. Charlottesville, home of Thomas Jefferson and UVA, is known as a quiet and progressive college town. It’s population of 47,000 had 80% of its voters choose Hillary Clinton during last year’s election. In April, the city council voted to remove the Lee statue but is on hold pending litigation. Two city parks that were named after Confederate generals were renamed, including Emancipation Park, the site of Saturday’s rally. Saturday’s planned rally has residents on edge and a group of more than 40 local business owners near the park have asked the city to protect them. “I have a lot of fears. I think most of us are just anxious, we don’t want there to be violence,” business owner Michael Rodi said of the rally. “We don’t want to see a blood bath, we don’t want to see looting, we don’t want to see mass arrests we don’t want to see the police having to turn on citizens,” he added. The Ku Klux Klan held a protest in Charlottesville against the removal of a Condeferate monument. Many businesses came together to discuss their rights and how to protect their staff in anticipation of Saturday’s event. Others expect to be understaffed, with some planning to hand out water and sandwiches to police officers. “If diversity makes you uncomfortable, this is probably not where you want to be” reads a sign that hangs in the entrance of Rodi’s business. Torch-bearing white nationalists confirmed the fears of residents and officials Friday night when hundreds descended upon the UVA campus. Chanting “blood and soil” and “you will not replace us,” the group rallied around a statue of Thomas Jefferson before they clashed with counterprotesters, CNN affiliate WWBT reported. The group left the university’s grounds when police arrived and ruled it unlawful assembly. 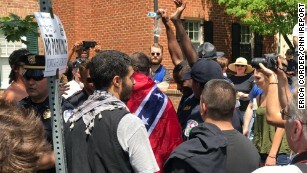 City and UVA officials condemned Friday’s march. “In my 47 years of association with @UVA, this was the most nauseating thing I’ve ever seen. We need an exorcism on the Lawn,” Larry Sabato, director of the University of Virginia Center for Politics tweeted. “Everyone has a right under the First Amendment to express their opinion peaceably, so here’s mine: not only as the Mayor of Charlottesville, but as a UVA faculty member and alumnus, I am beyond disgusted by this unsanctioned and despicable display of visual intimidation on a college campus,” he added. Friday’s march took place shortly after a federal judge granted a temporary injunction allowing alt-right activists to hold Saturday’s rally. Earlier this week, city officials had tried to “modify” the rally’s permit to move the demonstration more than a mile away to McIntire Park, citing safety concerns. Jason Kessler, who organized the “Unite the Right” rally, filed a lawsuit Thursday claiming the city’s intentions will violate free speech rights. “While the City is disappointed by tonight’s ruling we will abide by the judge’s decision,” the city said in a statement late Friday. “The goal in moving the Unite the Right Rally from Emancipation Park to a larger, more accommodating space like McIntire Park had nothing to do with the content of the demonstrators’ speech. CNN’s Madison Park, Kaylee Hartung, Joe Sutton, Devon M. Sayers and Chris Boyette contributed to this report.